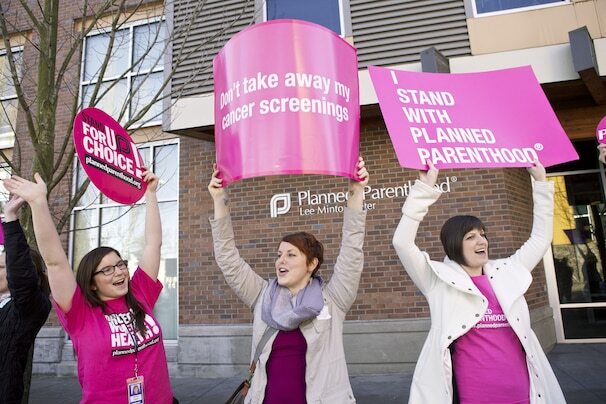 While the national fight over Planned Parenthood has died down for now, Republican governors and legislators in numerous states have fought to defund the group. The use of federal funds for abortion services is already barred under the Hyde Amendment, but many states have cut off or attempted to cut funding for Planned Parenthood altogether. On Friday, Arizona Gov. Jan Brewer (R) signed a law banning state funding for Planned Parenthood. Arizona already bans the use of taxpayer funds for abortions unless the mother’s life is at stake; the new law cuts off the group’s preventive health care and family planning services. Planned Parenthood sued the Texas’ Health and Human Services Commission to stop the exclusion of Planned Parenthood clinics from the Medicaid-funded Women’s Health Program. Last week, a Texas judge blocked the new rules on the grounds that the state could not provide alternate care for low-income women. But if the state decides to run the program without Medicaid money, the decision will be largely moot. Indiana Gov. Mitch Daniels (R) signed a law barring Medicaid patients from using Planned Parenthood last year. North Carolina’s legislature overrode a veto from Gov. Bev Perdue (D) to strip funding for Planned Parenthood from the budget. A judge blocked a law barring Planned Parenthood funding in Kansas last year. A new law in Wisconsin put new restrictions on abortion drugs, leading Planned Parenthood to stop providing them. Bills that would restrict Planned Parenthood are also on the table in Michigan, Nebraska, Ohio and Oklahoma. The bans in Indiana, Kansas and North Carolina all face legal challenges. “We will not let politics interfere with the health care that three million people rely on Planned Parenthood for every year,” Planned Parenthood President Cecile Richards said. But with the “war on women” a key plank in Democratic messaging, politics will likely come into play. Republicans face a significant gender gap in recent polling. Milwaukee Mayor Tom Barrett and former Dane County Executive Kathleen Falk , both Democrats hoping to unseat Gov. Scott Walker (R) in a June recall election, used the new Wisconsin law as part of a case that the governor is anti-women. Majorie Dannenfelser, president of the antiabortion group the Susan B. Anthony List argued that it cuts both ways. “At the voting booth, voters will reward elected officials who protect them from having to pay for abortions,” she said in a statement.